Circle Theater (Hilbert Circle Theatre) is one of the city’s best examples of a classic early 20th-century movie palace. The building is a fine work in the Neo-Classical Revival style with a Neo-Adamesque interior in the style of Robert Adams, an 18th-century British architect, who used a combination of Greek, Etruscan, and Pompeian motifs in his work. A livery stable occupied this site on Monument Circle from the 1830s until the early 1900s. In 1916, local businessmen bought the site and financed the construction of the theater. Prominent Indianapolis architects Rubush & Hunter designed the building. For the exterior, the two planned a Neo-Classical Revival façade of glazed white terra cotta, with Adamesque figures on the frieze across the top in the pediment. Irvington Group artist Clifton Wheeler used tinted cement to paint the mural over the marquee, depicting a pastoral scene. The interior of the theater includes classical-inspired coffered ceilings of plaster. Relief panels carry the Adamesque theme into the interior. The theater space combines historic elements such as the ornate wall ornamentation, with new seating and state-of-the-art acoustic measures. Like many theaters of this period, the Circle hosted live acts and film features. In 1928, the Circle played the first movie with sound ever shown in Indianapolis, The Jazz Singer, with Al Jolson. In the 1940s, big band jazz came to the theater, including Glenn Miller. By the 1970s, the Circle Theater had fallen into disrepair. The Indianapolis Symphony Orchestra decided to move back downtown to the Circle Theater in 1982. After an extensive rehabilitation, the Circle reopened as the new home of the Indianapolis Symphony Orchestra. 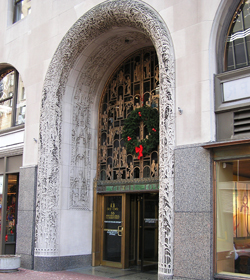 Circle Theater (Hilbert Circle Theatre) is located at 45 Monument Circle. The building is open for performances and group tours (call 317-262-1100 for tours). 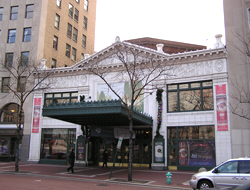 Hilbert Circle Theatre is home to the Indianapolis Symphony Orchestra. The orchestra and its pops orchestra offer a varied schedule of fine performances. Call 317-639-4300 or 1-800-366-8457 (Outside Central Indiana) for tickets, or go to the Indiana Symphony Orchestra website for performance schedules.